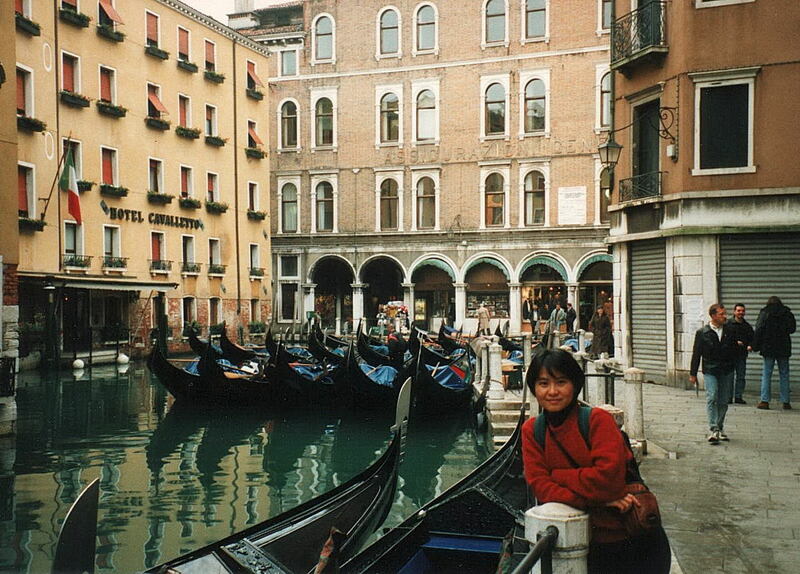 In December, 1996, I went to Italy with my wife, Yafei. Our plan was to begin in Venice, then work our way to Florence and Rome, and finally fly home from Rome. Our flight stopped first in Brussels, where we had to somehow pass 6 hours. We hadn't slept in about 24 hours, we knew nothing about Brussels, and we feared missing our flight to Italy. Nonetheless, we decided that 6 hours was sufficient time for a brief foray into downtown Brussels, so we took a train from the airport into the city center, and began walking around. We visited some large, impressive churches, and listened to priests chanting medieval-style music. We noticed that the streets weren't paved with asphalt, but rather with brick, "Belgian brick". I'm quite sure that we made it to the famous square known as the Grand Place. At any rate, we enjoyed our brief foray, and arrived back at the airport in time for our flight to Italy. We landed at the Venice airport, which is not actually in Venice, but in a nearby town on the mainland. We discovered that some of our belongings had become detached from our backpack, and were missing. We discussed the matter with an airport official, but to no avail. 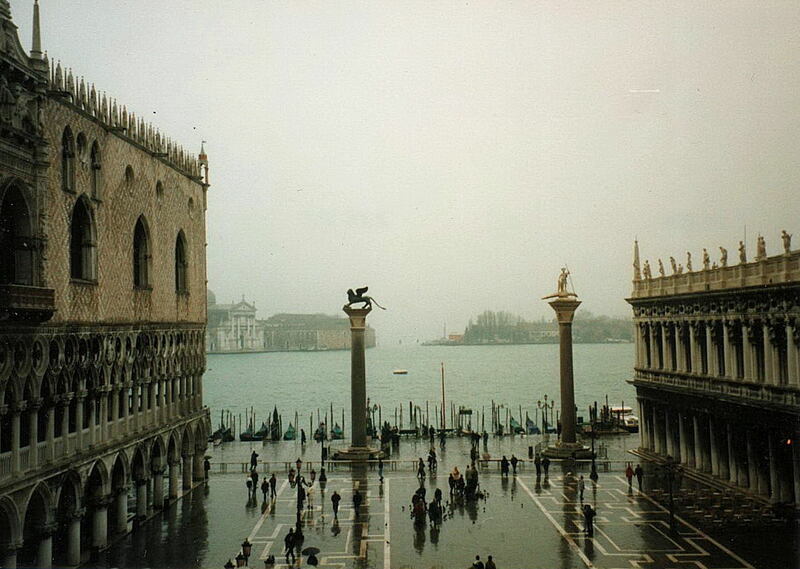 So we boarded a bus for Venice, and arrived there at about 6 p.m. on December 23, 1996. We didn't know where we were going to stay; we had called several Venice hotels from the U.S., but none of them were open at that time of year. The Venice bus station (known as the Piazzale Roma) seemed busy and turbulent. We collected our luggage, consulted our compass, and began walking eastward into the city. We immediately fell in love with Venice. It was very quiet — no cars, not even any bicycles. Small canals everywhere. The streets are narrow — usually about ten or fifteen feet wide — and lined with elegant little stores. There was a steady flow of people walking along. Most of them were relaxed — more intent on observing you than on reaching their destination. A few of them were hurrying somewhere, and sliced through the crowd with the help of a walking stick extended in front of them, like a ship slicing through the water keel-first. We tried to walk eastward, but the twists and turns of the streets frustrated our efforts. We sometimes found ourselves at the same spot where we had been fifteen minutes before. The Venetian labyrinth has baffled travelers for centuries, and now it was baffling us. We each had a heavy bag on our back, and another bag in our hand, and we hadn't slept for about 36 hours. There were no hotels in sight. Yafei was exhausted, so I decided to carry her bag. But soon I was exhausted, too. Finally we saw a sign that said "Hotel San Giorgio". They had a vacancy, and we took it eagerly. We left our bags in our room, then ventured once more into the labyrinth, hoping to see the Piazza San Marco, and get some dinner. After some wandering and circling, we found the famous Piazza, with its Byzantine cathedral at one end. Yafei was so excited that she insisted on taking some pictures, though it was too dark for pictures. There weren't many people in the Piazza; December is a slow tourist season in Venice. The Piazza was filled with music that wafted out from the cafés. There are two famous cafés in the Piazza. 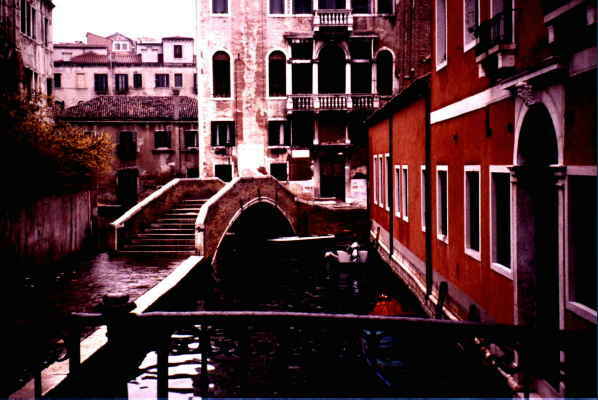 In the 1800s, when Venice was occupied by the Austrians, one café was frequented by Venetians, the other by Austrians. Adjoining the Piazza is a smaller piazza called the Piazzetta. The Piazzetta is overshadowed by two towering columns, bordered by the Ducal Palace, and looks out on the lagoon and islands. If Yafei, on her first trip to Europe, wanted to see the best that Europe has to offer, she had come to the right place. The Piazzetta with the Ducal Palace on the left, and the Sansovinian Library on the right. On top of the left column is a winged lion, the ubiquitous symbol of Venice. On top of the right column is St. Theodore, standing on a crocodile. It was quite late when we got back to our room, but jet lag prevented us from sleeping. So we looked at our maps, discussed our impressions of Venice, and enjoyed the view from our room, which was above a small, quiet canal. We finally fell asleep about 3 a.m., and then we slept through the hotel breakfast. We would have to improvise our own breakfast. Yafei tried to heat some water using a heating device and an adapter, but the adapter promptly exploded with a loud BANG and a puff of smoke, filling the room with the smell of burning plastic. So we got some hot water from the concierge, and some bread and fruit from a nearby store, then began our first excursion into Venice. Our destination was The Frari, one of the largest and best-known churches in Venice. To get to The Frari, we had to cross the Grand Canal via the Rialto Bridge. We wandered around for a long time (Yafei taking pictures all the while) before we reached The Frari. It was closed for lunch, and wouldn't re-open until 2. So we continued westward until we reached the head of the Grand Canal, then took a boat ride down the Grand Canal to San Marco. As we rode along, I expounded to Yafei all the architectural knowledge that I had acquired by reading Ruskin's Stones of Venice. After lunching, we entered San Marco, walked around the upper part of the church, and saw the famous bronze horses. Then we went to the back of the church (on the ground floor), and saw the coffin of St. Mark, and the gold altarpiece known as the Pala d'Oro, which was made in Constantinople in 976 A.D. Many of Venice's treasures come from Constantinople. The Byzantine style, in which San Marco is built, comes from Constantinople. The Dark Ages of the Western Roman Empire were the Glory Days of the Eastern Roman Empire, which was based at Constantinople. Venice was a link between West and East; Venice prospered by being a middle-man between West and East. Venetian traders often sailed past Constantinople and into the Black Sea, where they traded with people from Central Asia. The most famous Venetian trader, Marco Polo, followed the Silk Road through Central Asia all the way to China. Marco was indeed a link between West and East. After leaving San Marco, we took a boat to Giudecca (an island off Venice) in order to look at the Youth Hostel there. The Hostel seemed neat, inexpensive, and a good place to meet people from all over the world, so we decided that we would spend just one more night at the Hotel San Giorgio, then move to the Hostel. After resting in the Hostel dining hall and writing some postcards, we took a boat from Giudecca back to Venice, and then had dinner at one of Venice's Chinese restaurants. Next morning, we went once again to The Frari. This time it was open. We looked at the paintings, sculptures and tombs, then went next-door to the Scuola di San Rocco, which has a famous series of paintings by Tintoretto. Many of these paintings are on the ceiling, so visitors are given mirrors, allowing them to see the ceiling without looking up. Throughout our Italy trip, I was surprised at how poorly-lit many of the art works were, and how difficult it was to see them clearly. After lunch, we toured the Ducal Palace, the Bridge of Sighs, the prisons, etc., then we went to the Youth Hostel and had dinner. 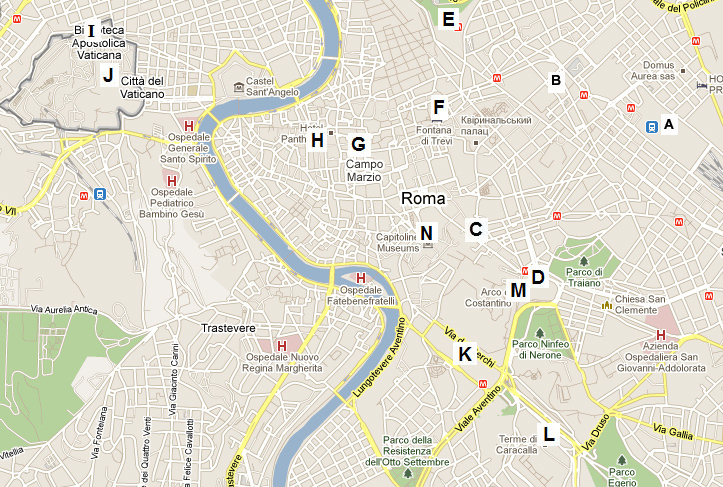 We met an Australian woman, Sandra, who told us about the hostels in Florence and Rome. (Sandra had noticed what we had noticed, namely, that Italians have a penchant for watching people.) We also met a Japanese man, Hosino, who gave us a packet of Japanese stamps. The Japanese are avid travelers, and we saw many large groups of Japanese tourists. When I saw these large groups moving through the Piazza, I was reminded of Joyce's line: "I hear an army charging upon the land." The next day, Christmas day, we went with some of our hostel friends to the Church of St. John and St. Paul (Giovanni e Paolo), which is one of the largest and most well-known of Venice's many churches. It was rainy, windy, and Venice was under water, so getting to the Church wasn't easy. Yafei's shoes weren't waterproof, so she rode on my back while I waded through the water. Venice is prepared for floods; it has many raised wooden platforms (Flood Sidewalks) to elevate pedestrians above the water. But these platforms are only in the busiest areas. Elsewhere, you have to rely on high boots, and you have to find streets where the water isn't too deep. After leaving the church, we went to the Jewish Ghetto, which is known as Europe's oldest Jewish Ghetto; it was created in 1516. Because of limited space, houses in the Ghetto were tall, and ceilings were low, allowing the maximum number of stories in a particular building. On Christmas night, we went to San Marco and saw a church service. This was the high point of the whole trip. We felt that we were witnessing something real, a real religious service, not an exhibition for tourists. We enjoyed the church music; I can still hear the choir singing "Ora pro nobis" (pray for us). We also liked San Marco's Byzantine architecture; the walls, ceilings and floors are covered with colorful mosaics. We had trouble sleeping at the Youth Hostel, and we wished that we had stayed longer at the Hotel San Giorgio. But there was a good view from the hostel; when we looked north, we could see the Ducal Palace in the foreground, and the Alps in the distance. On the 26th, we went up to the top of San Marco's campanile (bell tower). The wind on the top was so strong that you could barely stand. But the tower affords a view of the city, with its red tile roofs. Then we went to the Correr Museum, near San Marco's. It has some reliefs by Canova, some old Venetian weapons, some paintings, etc., but it's not one of Venice's most popular museums. After wandering through the entire 1st floor, we thought we were finally done, but a guard pointed to a flight of stairs leading to the 2nd floor. Yafei staggered with exhaustion, but the guard was implacable, and continued to point toward the 2nd floor. Yafei told the guard that we had already spent an hour in the museum, and would like to skip the 2nd floor. He refused. So we went through the 2nd floor at a jogging pace, ran down the stairs, then burst through the door to sunshine, blue sky, freedom. Next day, we got up early and began the journey to Florence. When we bought a train ticket, the ticket salesman short-changed us, so we vowed to count our change in the future. After a 3-hour ride, we arrived in Florence. We had called from Venice, and reserved a room at a place called La Mia Casa, near the cathedral of Santa Maria Novella. When the concierge showed us our room, Yafei asked to see the bathroom. The concierge asked her to repeat the question. "Can we see the bathroom?" "That's an incredible question," he said. "You ask that question in Africa, not in Italy. Take your bags and leave." Yafei apologized for her incredible African question, and finally the concierge relented, and allowed us to stay. Then we went to a big food market called the Mercato Centrale. It's not one big supermarket, it's 100 tiny markets under one roof. One merchant sells fruit, one sells candy, one sells nuts, etc. After lunching in our room on bread, wine, chocolate, etc., we visited the nearby cathedral, Santa Maria Novella. Then we visited the most famous cathedral in Florence, The Duomo. Its huge, reddish dome dominates the Florentine skyline. Like other Florentine cathedrals, The Duomo is made of green and white marble. Savonarola preached in The Duomo in the late 1400s, and excoriated the Florentines for their un-Christian lifestyles. Michelangelo, who heard Savonarola preach as a young man, said that sixty years later Savonarola's voice still resounded in his ears. Next day, we went to the Bargello Museum, which specializes in sculpture and has some famous sculptures by Donatello. In the afternoon, we went to a museum called "The Academy", where we saw Michelangelo's famous statue of David. Artists like Michelangelo seemed to arise nowhere in Italy except Florence. Florence produced as many famous artists as all the other cities in Italy combined, a fact that has never been adequately explained. And Florence's fertility extended beyond visual art; Florence produced such renowned writers as Dante and Machiavelli. Rome didn't produce a single prominent artist; the only artist of note that Rome ever produced is Pietro Cavallini, and today Cavallini is largely forgotten. In fact, the entire southern half of Italy produced few, if any, prominent artists; the history of Italian art is the history of art in the northern half of Italy, especially in Florence and Venice. After leaving The Academy, we walked to the Palazzo Vecchio, the most impressive building in Florence (with the exception of the famous cathedrals). When it was built around 1300, the Palazzo Vecchio was intended as the seat of government, comparable to the Ducal Palace in Venice. The Palazzo Vecchio has the stern appearance of a soldier prepared for battle. For defensive reasons, it has no windows at ground level. 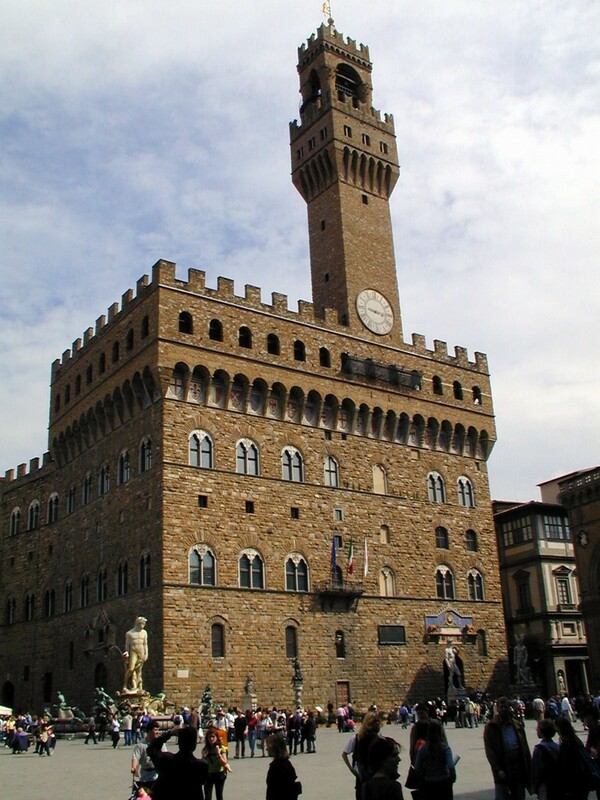 Its high bell tower makes it one of the most conspicuous buildings in Florence. Beneath the Palazzo Vecchio is the Piazza della Signoria, a spacious piazza adorned with sculptures and fountains. When Savonarola controlled Florence around 1490, the Piazza della Signoria was the scene of an annual "Bonfire of the Vanities", in which a huge pyramid of "vanities" — fancy clothes, jewelry, paintings, etc. — was consumed in flame. The Bonfire was part of Savonarola's attempt to lead Florence on a path of pure Christianity. (This attempt reminds one of Mao's attempt, during the Cultural Revolution, to lead China on a path of pure communism; both Savonarola and Mao used young people to carry out their programs.) When Savonarola was overthrown in 1498, he himself was burned at the stake in the Piazza della Signoria. When Yafei and I were in the Piazza (on December 28, 1996) Florence was in the grip of a cold wave, and the Piazza's fountains were festooned with icicles. We were freezing on the same spot where Savonarola had burned. Next day, we came back to the Piazza della Signoria, hoping to go to the nearby Uffizi Museum, but we were discouraged by the long line outside the Museum. So we continued walking, over the Ponte Vecchio, past the Pitti Palace, and up to a fort called Belvedere. Though we didn't enter the fort, we had a good view of Florence from its grounds. Then we went to the Piazzale Michelangelo, which is also on a hilltop, and also affords a good view of the city. 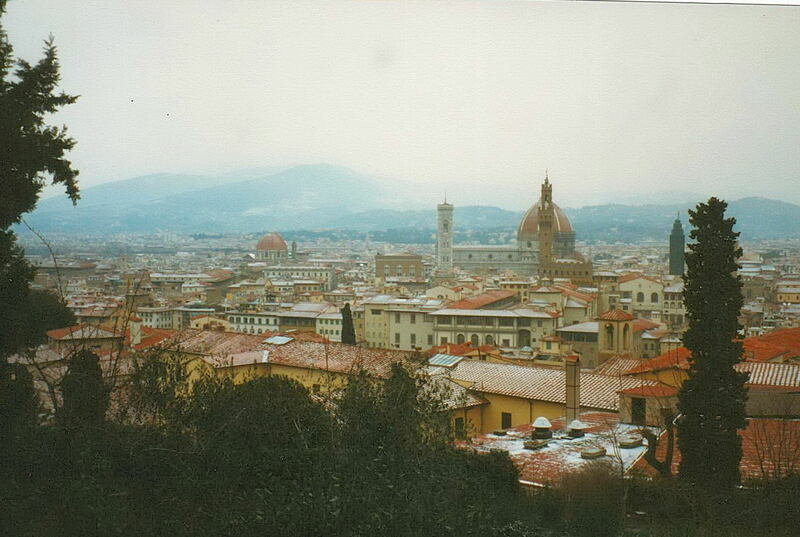 One might compare this view of Florence to the view of Venice that we had from the top of the San Marco bell tower. Looking down on the famous dome from a nearby hill. The Palazzo Vecchio is in front of the dome. Then we walked downhill, crossed the Arno again, and returned to our hotel near Santa Maria Novella. Before dinner, we made one more excursion, to the Cathedral of Santa Croce, which was full of interesting sights, including the tombs of Michelangelo and Machiavelli. Then we called several hotels in Rome, hoping to reserve a room, but they were all full, so we decided to spend another day in Florence. In the morning, I went to the Mercato Centrale, the food market that has 100 little shops under one roof. I bought fruit from a woman who carefully weighed the fruit twice — pretending to be an honest merchant — then spoke a torrent of Italian, though she knew I didn't understand a word she said. Finally, she concluded her speech by asking for a sum of money that was far in excess of what I really owed her. I paid her what she asked for, partly because I hadn't had time to translate kilograms into pounds, and lira into dollars, and partly because it was easier to pay than to argue. She took leave of me with an outpouring of false amiability — "ciao", "grazie", "bongiorno", etc. I wondered later how many hundreds of tourists she had cheated in her lifetime. After breakfast, we went to the bus station and bought tickets for San Gimignano, a small town whose scenic location and attractive architecture make it a tourist mecca. Snow covered the ground, and all the buses were delayed. Our bus wound through fields of olives and grapes. 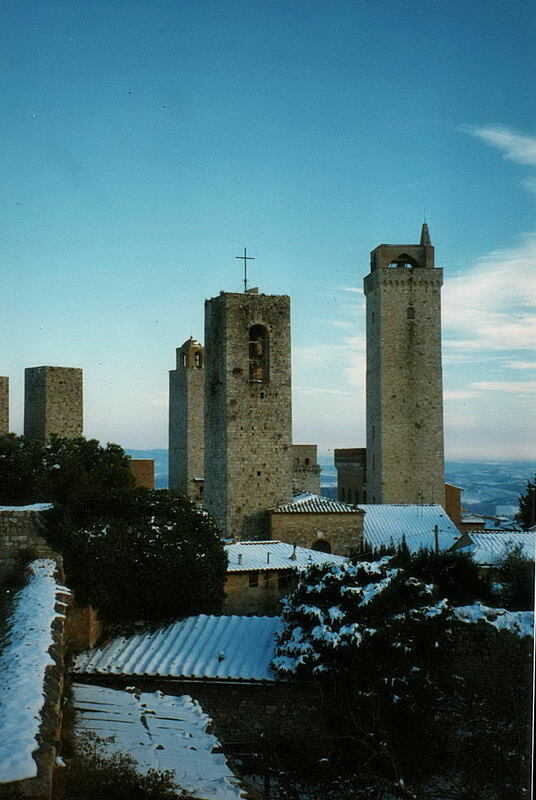 Finally, we saw San Gimignano in the distance: tan-colored buildings crowded together on the top of a hill, surmounted by several tall towers, and ringed by a defensive wall. We walked through tunnels and alleys, and took some pictures from the top of one of the towers. The architecture is well-preserved, and uniform in style and color. The homeowners, forbidden to make their homes unique, express themselves in their front doors, which are the most elegant you can imagine. Perhaps we should have visited other towns, less famous towns. A New York Times article about Henry James’ travels mentions Arezzo, Cortona, Perugia, and Assisi. All four of these towns are between Florence and Rome. Also between Florence and Rome is Siena. Next day, we checked out of our room, paid the hotel-keeper (who had once started to eject us because of Yafei's incredible African question), and then took a train to Rome. Once in Rome, a man wearing a badge offered to help us find a room. He said that he had one for 300,000 lira, and that there was nothing cheaper to be found. We decided to walk around, and try our luck. We entered a hotel, and the concierge said he had no vacancies, but he called a nearby hotel, and was told that they had a room for 135,000 lira (about $90). It was called the Hotel Elide, and it was on the Via Firenze, near the Via Nazionale. Like our room in Florence, this room had a high ceiling, and a shower that was part of the bathroom — there was no partition or curtain separating the shower from the rest of the bathroom. After unpacking and resting, we went for a walk, and made a big circle around the Forum and the Coliseum. Rome seemed to lack the charm of Venice. It's a big city — noisy and full of traffic. (If only Italy had more bicycles and fewer motorcycles!) Perhaps we stayed too far east; the heart of the city, the old part of the city (Vecchia Roma), is further west, closer to the Tiber. Next day, we walked to the Spanish Steps, the Trevi Fountain, the Pantheon (which was closed) and the Piazza Navona (which had been turned into a noisy, messy fairground). At the top of the Spanish Steps, we watched artists making sketches and caricatures for tourists. Next day, we took the subway to the Vatican Museum. There was a long line outside, but it moved quickly, and soon we were making our way down the long hallway known as the Gallery of Maps. Then we entered the Sistine Chapel. Though we were impressed by the paintings, and by Michelangelo's distinctive style, the Chapel was rather dimly-lit and crowded. On one wall of the Chapel is Michelangelo's Last Judgement, in which he has depicted the tortures of the damned in Hell. Jostled by crowds of tourists, I looked at Hell, and it seemed spacious and airy compared to my own situation. I couldn't understand why the damned enjoyed such pleasant surroundings, while I was so crowded and uncomfortable. I reflected on my past life — from the present time all the way back to my early childhood — but I couldn't recall any sins that merited the tortures to which I was being subjected. After leaving the Sistine Chapel, we went through the Raphael Rooms, and saw such famous works as the School of Athens. Then we visited the Picture Gallery, which contains paintings by Titian, Caravaggio, etc. Now our energy was almost completely exhausted, but we managed to stagger into a collection of ancient sculpture, and take some pictures with our last ounce of energy. By this time, our bodies longed to dissolve in a heap on the floor, but our minds wouldn't permit our bodies to do that, but instead drove them onward, onward, to yet another destination: St. Peter's Basilica. We weren't attracted by St. Peter's immense size or by its Baroque style. But we enjoyed walking around, and seeing the various sights: Bernini's colonnade in front, the elegantly-attired Swiss guards at the entrance, Michelangelo's Pietà in one of the chapels, the bronze statue of St. Peter by Arnolfo di Cambio, etc. Then we took the subway back to our hotel, rested our weary limbs, and bought some presents to take back home. Next day, we took the subway to the Circus Maximus, which is now an open, grassy area used by joggers. 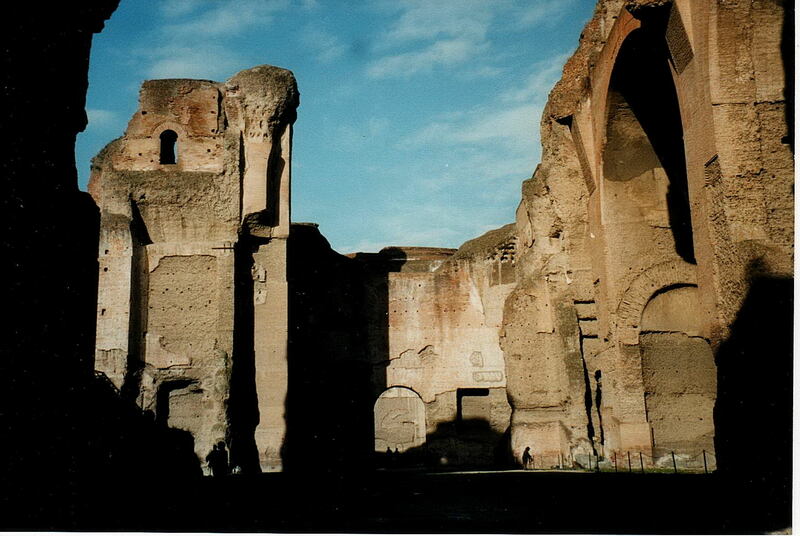 From there, we walked to the Baths of Caracalla. The Baths are spacious, quiet and uncrowded. What remains of the Baths are towering brown walls of brick and clay, with arched doorways. While walking in the Baths, we felt closer to the ancient Romans than we felt at any other time during our stay in Rome. Then we walked past the Arch of Constantine to the Coliseum. It was a hot day; the icy weather of Florence seemed far away. Yafei took off her jacket, exposing the purse that she had been concealing underneath. Pickpockets were immediately attracted to her purse, but we could see what they were trying to do, and they had no chance of success. Then we walked up Capitol Hill (sometimes called Campidoglio). On the way there, we encountered a group of young girls who were trying to pick pockets. They used a piece of cardboard to distract your attention and to conceal their movements. Such bands of youngsters are a well-known feature of European cities; we weren't surprised to see them, and we were confident that we could protect our belongings. Later we watched from a distance as they approached and harassed another couple. From the Campidoglio we walked to the Pantheon. This time it was open. We saw the tomb of Raphael, and the tombs of several Italian kings. All around the Pantheon were stray cats; Rome is famous for its fountains and its cats. Next day (Saturday, January 4), we checked out of our room, took a train to the airport, and began the long journey back to Rhode Island. We flew from Rome to Brussels, then Brussels to Boston. I caught a cold and a fever when I stepped from balmy Rome into chilly Brussels. For 48 hours after landing in Boston, I could scarcely walk. But even sickness didn't prevent us from looking through our pictures, re-reading our notes, and regaling people with stories. We had spent two weeks in Italy.